After being named a finalist in 2016, Grant County’s own, Mrs. Shannon Brickler, was one of 104 teachers nationwide to be awarded in July, 2018, the prestigious Presidential Award for Excellence in Mathematics and Science Teaching (PAEMST). WHAT CAN YOU DO TO PROMOTE SAFETY IN GRANT COUNTY SCHOOLS? PRESCHOOL CLASSES FORMING NOW FOR 2018-2019! Do you have a 3- or 4-year-old who qualifies for preschool? The Grant County School District is excited to announce Kindergarten registration for the Class of 2031! BORNLEARNING ACADEMY OFFERED FOR FAMILIES OF TOTS! Seats are filling now for the BornLearning Academy program for families with infants, toddlers, and preschoolers! The 2017 Grant County High School Yearbooks are now available and may be picked up in the GCHS Library. HALEY BRYAN, GCHS SENIOR, TO REPRESENT KY IN NATIONAL POETRY OUT LOUD COMPETITION! SEVEN CHOSEN FOR PRESTIGIOUS GOVERNOR'S SCHOLARS PROGRAM! GRANT COUNTY PRESCHOOLS EARN 5-STAR RATING! Congratulations to the preschool programs at CMZ, DRE, MCE, and SES, who have each earned Kentucky All STARS' highest rating for early childhood education programs! GCHS ENGINEERING PROGRAM NAMED PROJECT LEAD THE WAY "PROGRAM OF EXCELLENCE"
GRANT COUNTY’S SHANNON BRICKLER NAMED A FINALIST FOR THE PRESIDENTIAL AWARD FOR EXCELLENCE IN MATH AND SCIENCE TEACHING! Are you ready to run? Registration for the Grant County Youth Cross Country Series will be held at Sherman Elementary August 25, with the final date for registration being September 1, 2016. 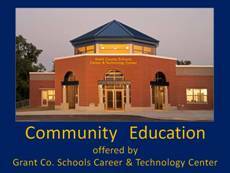 Blue & Gold cards, providing free admission for senior citizen to Grant County school functions, are available at the Grant County Board of Education office. GCMS and GCHS CHOIRS SCORE DISTINGUISHED! Grant County students are making lots of beautiful music! Congratulations to our GCMS 7th & 8th Grade Choir and our GCHS Chamber Choir for their Distinguished ratings at this week's KMEA choral assessments! Kindergarten Registration events will take place April 11 - 15; Preschool Registration will be April 18 - 22, 2016. ENJOY AN AMAZING CONCERT BY THE GCHS JAZZ ENSEMBLE! BRYAN WINS GCHS POETRY OUT LOUD COMPETITION; HEADS TO STATE! A team of students from GCMS have been invited to peek inside the world of advanced manufacturing, then share what they learn! 22 GCHS musicians selected to perform at the Kentucky Music Educators Association (KMEA) prestigious showcase event! Time is running out to purchase your 2016 Grant County High School yearbook! GRANT COUNTY MARCHING BAND WINS STATE! GCMB wins Kentucky Music Educators Association (KMEA) State AAAA Marching Band Competition! GC MARCHING BAND HEADS TO STATE! Grant County Marching Band earns first place in AAAA Quarter-finals (East Regionals), heads to state! Click here to enjoy their first place, East Regional performance. GC MARCHING BAND INDUCTED INTO GRANT COUNTY SCHOOLS HALL OF FAME! On October 10, 2014, the Kentucky Department of Education announced that Grant County Schools had received approval to utilize a "snow learning" plan when students are off for inclement weather..... Click here for parent letter explaining process. GRANT COUNTY HIGH SCHOOL TO OFFER ProStart CERTIFICATION! LACEY EARNS SPOT AT PRESTIGIOUS GOVERNOR’S SCHOOL FOR THE ARTS! GCHS Sophomore, Cassidy Lacey, has been chosen to participate in the prestigious Governor’s School for the Arts…. SIX GCHS JUNIORS SELECTED FOR PRESTIGIOUS GOVERNORS SCHOLARS PROGRAM! GCHS SYMPHONIC BAND EARNS STRAIGHT DISTINGUISHED! Dry Ridge Elementary organizes "For the Love of Reading" Book Drive to benefit the "Red Bird" Mission! CALHOUN ACCEPTED AT GATTON ACADEMY! ELEMENTARY BOYS BASKETBALL TEAMS FORMING NOW! GC CHESS TEAMS EARN NATIONAL RANKING! GCMS K-6 Team Ranked 24th in Chess SuperNationals; K-8 Team Ranked 23rd in Nation! Reed’s artwork, depicting the Kentucky Department of Agriculture’s Farm to School Program, will appear in a calendar distributed throughout the state…. ELEVEN GCMS STUDENTS CHOSEN FOR NORTHERN KENTUCKY SELECT BAND! STATE-WIDE EDUCATION MAGAZINE FEATURES ARTWORK OF MCE STUDENT!